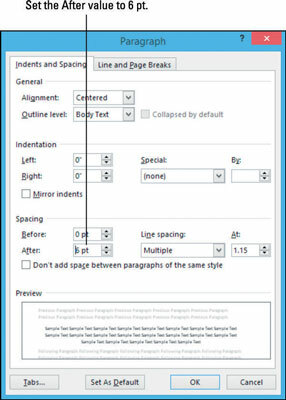 Word 2013 allows you to set line spacing to any of several presets such as Single, Double, and 1.5 Lines, or to an exact value measured in points. A point is 1/72 of an inch. Space before and after a paragraph is specified in points, too. Line spacing is the space between the lines within a multiline paragraph. Before is extra spacing added above the first line of the paragraph. After is extra spacing added below the last line of the paragraph. Vertical spacing refers to the amount of space (also known as the leading) between each line. The first part of the word leading is pronounced like the hazardous metal common in old houses (not like the abbreviation for leader on a business project). If you specify an exact amount of space per line and you change the font size, the text may not look right anymore. For example, if you change the font size to a larger size than the exact spacing is set for, the lines might overlap vertically. If you aren’t sure what font sizes you need, don’t use exact spacing. 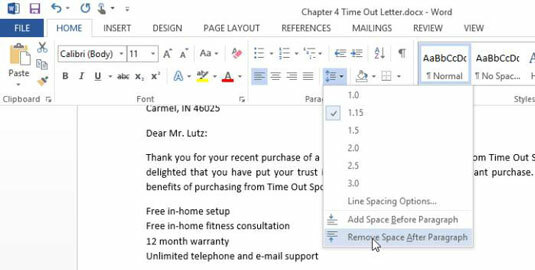 In your Word 2013 document, press Ctrl+A to select the entire document. Select any paragraphs which have spaces in between them. In this example, the paragraph begins with “Free in-home setup . . .” and the next two paragraphs following it. 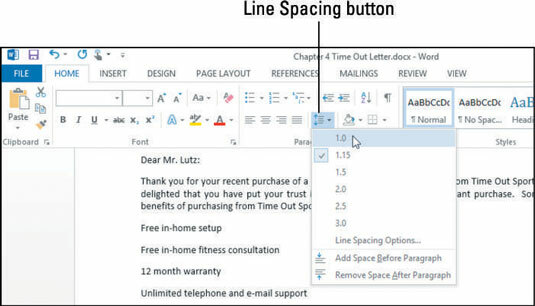 Click the Line Spacing button again and then choose Remove Space After Paragraph. Select the your heading at the top of the document. Click the Line Spacing button again and choose Line Spacing Options. Note: You can also click the dialog box launcher for the Paragraph group to open the Paragraph dialog box if you prefer that method. Decrease the value in the After text box to 6 pt and then click OK to accept the new setting. Triple-click the quotation paragraph to select it, and then click the Line Spacing button again and choose Line Spacing Options. The Paragraph dialog box opens again. 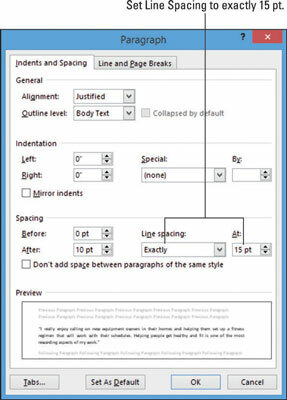 From the Line Spacing drop-down list, choose Exactly; then type 15 into the text box to its right and click OK.
For more practice, set the font size for the paragraph you just formatted to 24 points and watch what happens to the line spacing; it stays at 15 points, and the lines overlap. Press Ctrl+Z to undo when you’re finished experimenting.